I’ve got another cool industrial pipe tutorial for you guys! 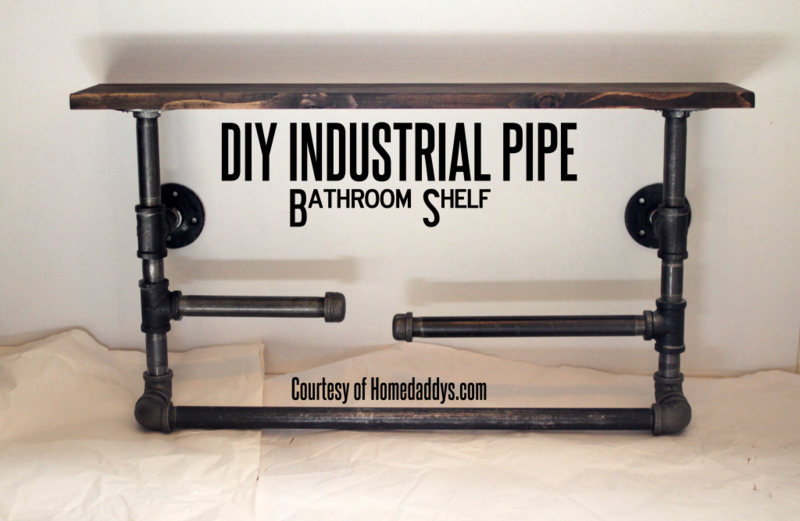 This time I built a nifty Industrial Bathroom Shelf out of recycled pipes for Katie, who runs the incredibly cool Upcycled Treasures blog. Not to toot my own horn, but this thing is like the Rolls Royce of bathroom shelving. It’s got a big towel rack, it’s got a distressed wood shelf, it’s got a paper towel holder and it’s got another rack thing that I haven’t even figured out how to use yet. This was a really fun build and it felt really good to help spread the gospel of upcycling. Seriously people, if you want rustic stuff then check out a junkyard before you go check out Restoration Hardware. You’ll save about $500 and you’ll have a story to tell. Now, stop wasting your time here and go check out my DIY INDUSTRIAL SHELF on Upcycled Treasures immediately. And leave a comment letting Katie know how wonderful she is, because while you’re just sitting there twiddling your thumbs she’s out in a workshop somewhere, decorating the world with stuff most of us would consider junk.